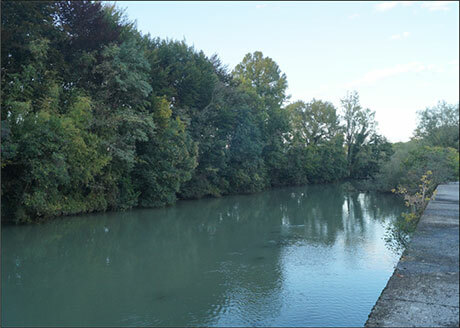 On a 6 hectare site in northern Italy, an extensive enhanced reductive dechlorination process had been previously been carried out by REGENESIS using a combination of proprietary electron donors (3-D Microemulsion and HRCs). 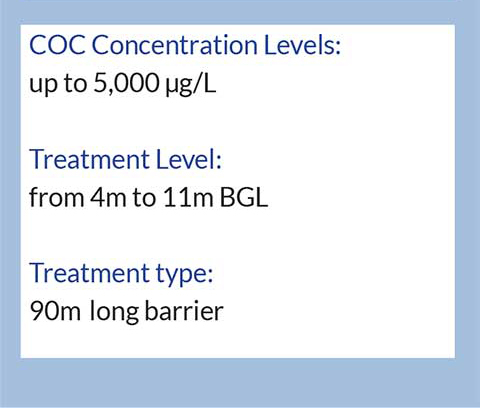 This resulted in successfully reducing TCE contamination and its daughter products from high levels (suggesting the presence of some DNAPL) to low dissolved phase concentrations. The concentrations were suitably low to allow regulatory closure of the internal part of the site. This was achieved within 2 years from a single injection. Immediately beyond the downgradient site boundary, a river presents a sensitive receptor. This, plus legislative rules, determine that the site boundary targets are very stringent (<1 μg/L). Although the previous electron-donor application has reduced the contaminant influx dramatically, at such low concentrations, biodegradation alone may not reach these low targets. Therefore, a second phase treatment has been implemented in order to enhance the biodegradation process further using PlumeStop, a Liquid Activated Carbon. This application will adsorb the contamination and provide a biomatrix on which the dehalogenating bacteria will come into contact with the chlorinated solvents. This combination of sorption and biodegradation will provide an enhanced reduction in contaminant concentrations, which will then be sustained and further contaminant influx is adsorbed and degraded. 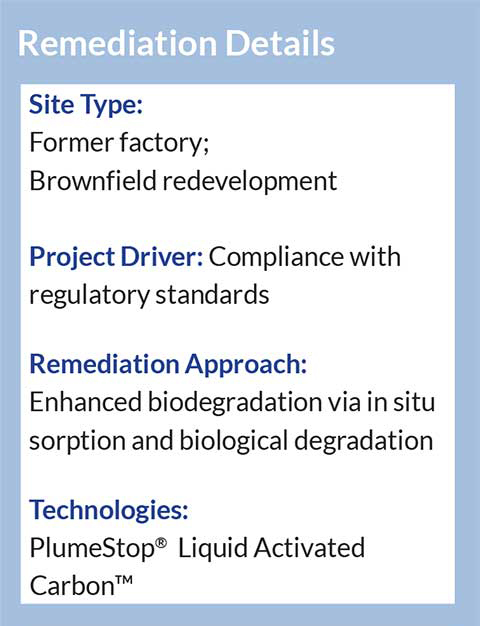 PlumeStop was applied in a double pilot test performed in two areas of the site, where different contaminant concentrations were observed. This was useful for demonstrating technology’s efficacy and to design and accurate dose for the full scale treatment. A larger PlumeStop barrier application is now being implemented along the site boundary. This will create a subsurface activated carbon filter along the length of the downgradient boundary. This consists of approx. 150 direct push injection points, performed using two Geoprobe rigs, in parallel. 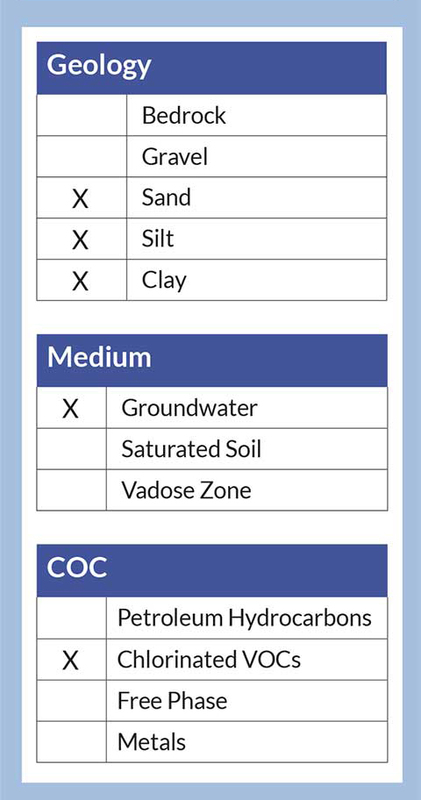 The dosage has been tailored for each sub-area depending on the contamination concentration and heterogeneity of the alluvial subsurface. Unique in situ process allows for fast depletion of residual organic contaminants in order to reach very stringent values using only a single application. Bioregeneration of the injected carbon filter is achieved through biodegradation of the sorbed chlorinated compounds: this provides long term treatment (years – decades) from a single application. The system will replace a costly Pump & Treat barrier that has worked to hydraulically confine the site for 10 years. 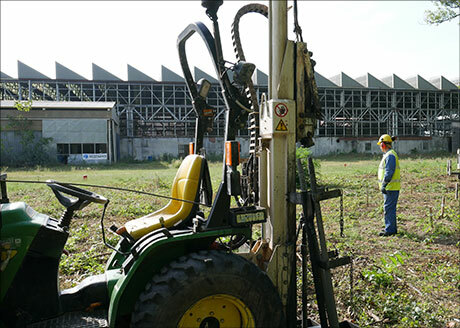 This will allow the owner to finally cease all site remediation activities and allow regulatory site closure.